I had the pleasure of doing a keynote talk at the “Ending Global Hunger Conference” at the Center for Global Food Security of Purdue University . My talk was entitled “Why Hunger Amidst Plenty?” My slides are here. The punchline of the talk was this: We are living in a complex world made up of multiple burdens of malnutrition. While the obstacles to address the burden are daunting for citizens, there are tools to solve it. We just need political will, global cooperation, and immediate action. The malnutrition burden is massive. But the story is mixed - there is the good, the bad, and the ugly. Let’s start with the good. Stunting is coming down - in some places quite fast - like Ethiopia, Bangladesh and Nepal. 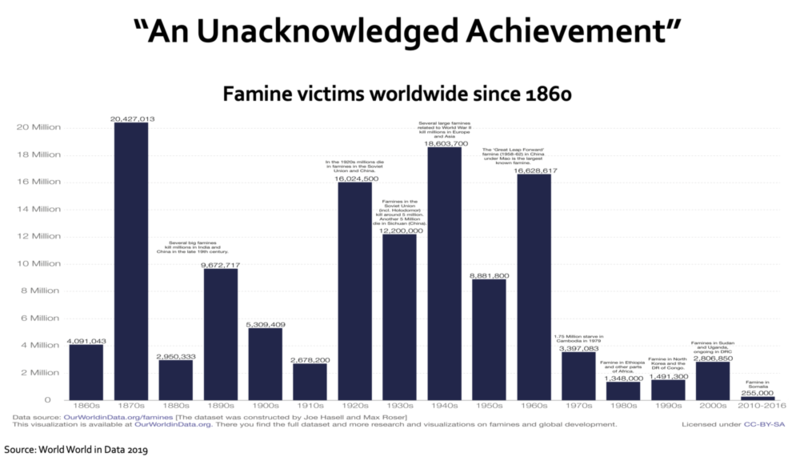 Also, the risk of dying from a famine has become much, much smaller than at any time in history. Then there is the bad. For the third year in a row, there has been a rise in world hunger. The absolute number of undernourished people has increased to nearly 821 million in 2017, from around 804 million in 2016. These are levels from almost a decade ago. Further, “hidden” hunger remains significant but is shrouded in mystery. We don’t know the state of micronutrient deficiencies, particularly among the nutritionally vulnerable populations, such as children under five years of age, women and adolescent girls. And now the ugly. Overweight and obesity is rising everywhere and among every stage of life. No country has stopped the trends we are witnessing. Why do we still have hunger & undernutrition? Why are we not seeing improvements? And in some cases reversals of progress? How did we get to this place of paradox: hunger & obesity? I argue that hunger is still rampant because of poverty, conflict change, conflict, poor infrastructure, unstable markets, food loss and waste, and periods of seasonal hunger in rural places. But how did we get to this place of paradox? That is complex but in a nutshell, our lives and lifestyles are transforming as are our diets and food systems. Many in the world are now consuming sub-optimal diets, exercising less and hence are more sedentary, and these contribute to the risk of disease and death. At the same time, healthy diets are not accessible to all. Care. We need governments, industry and citizens to care about their diets and their nutrition, climate change and food systems. Push for countries to develop a food systems policy. No country has implemented a full range of updated, comprehensive, and evidence informed strategies to encourage a healthier and more equitable food system. Consider the situation a “Syndemic” and take on triple duty actions. Consider options for keeping the food system within environmental limits. Dietary, technological change on farms, and reductions in food loss and waste are critical to reduce environmental impacts of our food system on the planet. Don’t forget about who will continue to feed the world. As Ruth DeFries eloquently wrote: “Now we are transforming from farmers to urbanites. Our newest experiment-to feed massive numbers of people from the work of a few-is just beginning. The outcome is yet to be seen.” Who will feed us when the average age of the world’s farmer is 60? Invest in small and medium holder farmers. Smallholder farmers have more diversified landscapes, making important contributions to the overall dietary diversity for the world’s population. 53-81% of micronutrients in the food supply are produced by small and medium farms. These farms make up 84% of all farms and 33% of the land areas globally and are more predominant in Asia and sub-Saharan Africa. Maximize net increases of nutrition along value chains. Identify points in the chain that can be “leveraged for change.” Leverage points can cause nutrients to be lost or exit the value chain as well as enhance the nutritional value of select nutrient-rich foods. Engage and empower women in on- and off-farm opportunities. Women need social capital including information and access to new technologies and farming practices and tapping into social networks that may assist in times of hardship. Women need access to credit with greater ability to invest in infrastructure and to smooth consumption or production shocks. And last, we need to improve their human human capital and agency - give them opportunities for education, and increase their ability to get health and nutrition services.